Out of the Cage: Freedom takes all forms, including how to learn to live with yourself…and your limitations. 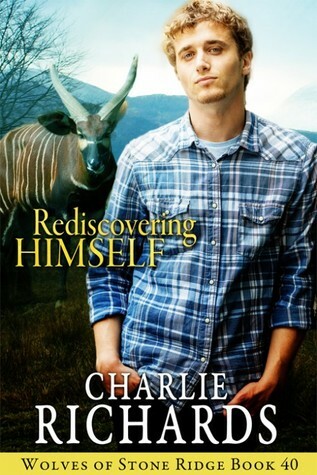 Rediscovering Himself is the fortieth book in the Wolves of Stone Ridge series by Charlie Richards. It was well written and nicely edited. I love how the books are written and fleshed out. The characters have depth to them, and it just made me want to read more and more. These books are nice light hearted quick reads. This is the second book that I’ve read in this series. I also read The Hated Finn book thirty-nine in the series also. The Hated Finn’s where we meet Drako Rudin for the first time. His sister ropes Vicktor into giving him self-defense lessons after being beaten up by some of his schoolmates. Vicktor is the one who stopped the beating and got him to the hospital. Drako becomes friends with Vicktor and his mate Finn, and Drako learns that the paranormal world’s real. He also agrees to help move Finn’s ostriches to their new farm. So Rediscovering Himself starts from this point for Drako. I liked Drako’s character. He’s pudgy and sweet and is a hopeless romantic, but he has never been in a relationship, so he doesn’t have a lot of experience, and so he has that shy innocence to him also. You just want to hold him and protect him. He’s quite lovable. He does have some issues with how his body looks, and it constantly has him blushing as his mate admires him. Victor and Finn have to stop and check in with the local alpha after unloading the ostriches at their new ranch, and it’s here at the alphas property that Drako meets Kwanza for the first time in his Bongo form. He’s instantly attracted to the unique animal that he’s never seen before. He finds him fascinating and beautiful, and that’s before he finds out that he’s a shifter and his mate. Kwanza’s one of the shifters that was rescued by the pack from the scientists’ laboratory. He’s been stuck in his Bongo form for 67 years and has forgotten how to shift to his human form. He’s living at Alpha Declan’s property and is with him when he smells his mate for the first time which triggers a shift to human form. However, Kwanza doesn’t have control of his shifts yet, but Drako’s definitely the key to helping Kwanza become whole again. I absolutely loved Kwanza and Drako together. They complement each other perfectly and have wonderful chemistry. I can’t wait for the next book in the series to come out so that I can read it. Until then, I will start working my way through the 38 other books in the series that I haven’t read yet.